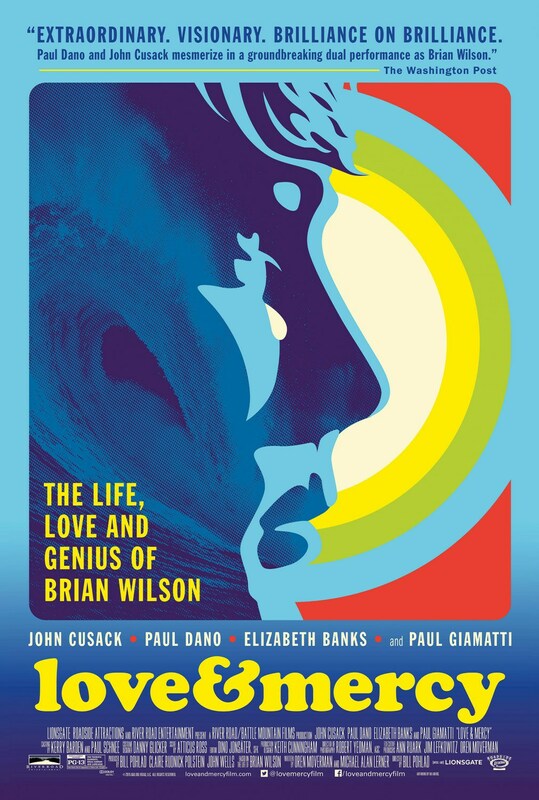 Just about as good as a music biopic gets, the twin leads of Paul Dano and John Cusack shine as the Beach Boys hitmaker Brian Wilson in Love and Mercy, directed by Bill Pohlad. It’s earworms like this 60’s classic that put Wilson, his brothers Dennis & Carl, along with cousin Mike Love and friend Al Jardine at the top of the pop charts and forever embedded in pop culture as purveyors of pure surf music. Love and Mercy was co-written by Oren Moverman, known for the Bob Dylan biopic I’m Not There. The film tells the story of Wilson from the perspective of his second wife Melinda Ledbetter, played by Elizabeth Banks. They meet when Wilson goes to buy a new car and he asks the cute blonde saleswoman (Banks) on a date. Their exchange in the front of the car while Wilson’s minders look on sets the scene for the key issue in his life – namely the omnipotent control held over him by the “crazier than his patients” psychiatrist Dr. Eugene Landy played superbly by Paul Giamatti. WIlson’s mental health, a key factor in the creation of the album Pet Sounds, is touched on but never explained beyond linking his paranoid schizophrenic delusions and borderline bipolar disorder with his earlier consumption of drugs and alcohol. The exquisite detail that has gone in to recreating how Wilson went about creating his masterpieces that were met with varying critical and commercial acclaim, puts this film way ahead of the curve in the musical biopic category. The performances are superb, the real life events portrayed in the film alternate between inspirational, chilling, fascinating and unbelievable, and Wilson was apparently “absolutely in fear” for ten minutes after watching the film because of the authenticity of Giamatti’s portrayal of Dr Landy. Amongst these excellent performances, it’s no mean feat that Banks as Wilson’s wife Melinda holds the foundation of this film firm, with her character’s love for Wilson enabling the couple to navigate truly horrible circumstances. It’s up there with Control and Walk The Line. And having come away from both those films with a new found respect and appreciation for the music of Joy Division and Johnny Cash, Love and Mercy left me with a desire to dig out some of Wilson’s tunes too. Enter your email address to follow Jabbatron.com and receive notifications of new posts by email.